Do you ever just have the need to write, draw, sketch, or just create? Well, if you do, then you will need to head to our journals section! Here you will find the medieval journal or notebook that suits your tastes. And even better, these notebooks are perfect for virtually anything you could use a good sheet of paper for. These fantasy journals are so much more than just sheets of paper, though. In many regards, they are collectibles and decorations all to their own! Our medieval journals come in all different shapes and styles, ranging from classic hard-backed notebooks of the modern day to old-fashioned leather journals that look like they could have come from the pages of history. And being more than just typical notebooks, they all feature classic medieval designs, ranging from the realms of fantasy and fiction to the realms of realism and history. Some of our journals and notebooks feature fictional creatures like fairies, dragons, and vampires, while others depict symbols like the Celtic cross, the Tree of Life, or even the classic green man! Of course, you can put these notebooks and journals to virtually any use. Traditional hardback notebooks are perfect as sketch-pads and scratch notebooks to fill with thoughts and ruminations, while leather-bound journals are more authentic and make for great costume props or spell books (as well as great pads for calligraphy). Heck, you can even dig out an old quill pen and feel really authentic when you write! However you use it, you can rest assured that when you are writing one of our notebooks or journals, you are writing in a notebook that is bound to possess a touch of medieval and personal style! A portable little notebook can be a handy tool, one perfect for keeping personal thoughts, sketches, and writings safe and secure. The Adventurers Leather Journal With Lock is just that, thanks to its size and its swivel lock. If you can see everything, then you will know everything. Write down what you know, which might just be everything, in this All Knowing Eye Embossed Leather Journal! 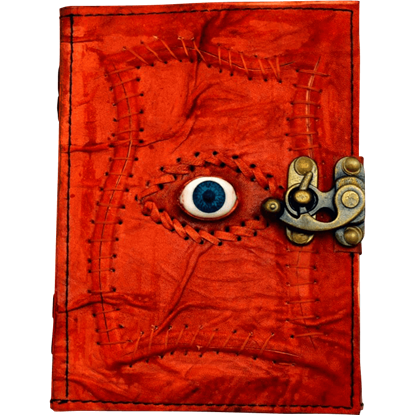 The eye design on the stitched red leather cover never blinks. 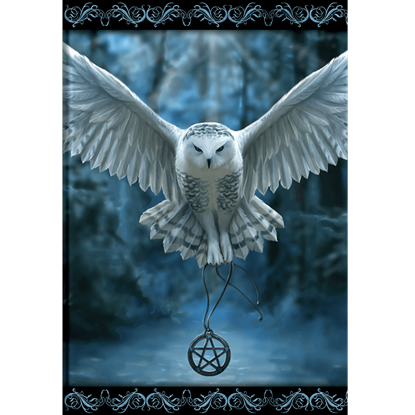 On wings as soft as a whisper, the majestic predator on the Awaken Your Magic Embossed Journal swoops in with a talisman meant to awaken your destiny. 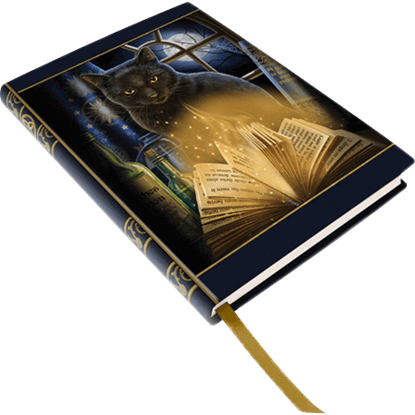 Featuring cover art by Anne Stokes, this magical notebook is sure to inspire you! Maybe your journal is where you keep your daily thoughts and ideas, or perhaps it doubles as your record of magical spells! Either way, the Bewitched Black Cat Journal is a great notebook choice for lovers of the supernatural world. 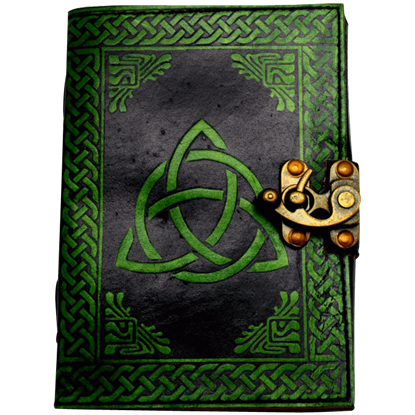 If you are fond of writing things down, invest in a beautiful vessel in which to store your thoughts, such as the Black and Green Leather Triquetra Journal. This gorgeous leather notebook features embossed Celtic-inspired designs. 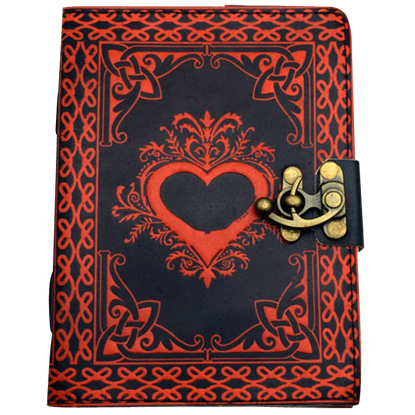 Ready to store thoughts, memories, and more, the Black and Red Heart Journal makes a beautiful personal diary or a thoughtful gift for a loved one. An ornate heart surrounded by Celtic-inspired designs is embossed on the cover. 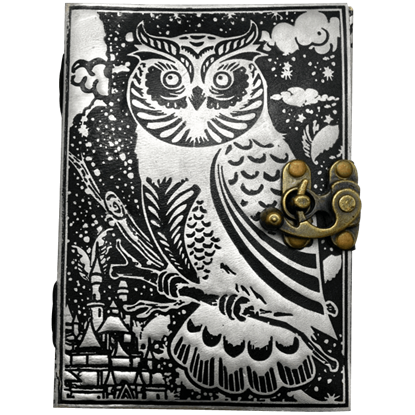 Let your wisest thoughts take flight when you record them in the Black and Silver Leather Owl Journal. An incredible owl illustration in celestial black and silver is embossed onto the cover of this high quality leather notebook. 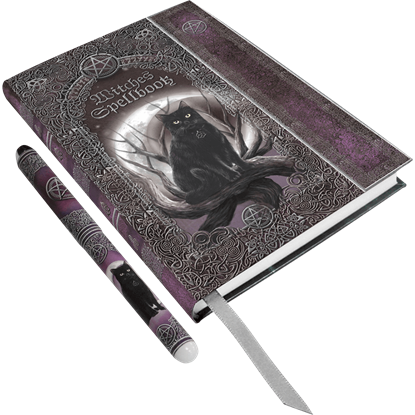 An exceptional journal that is superb for writing down your thoughts, emotions, observations, spells, or sketches, the Black Cat Embossed Spell Book with Pen is wonderfully versatile and provides 160 pages for you to fill. 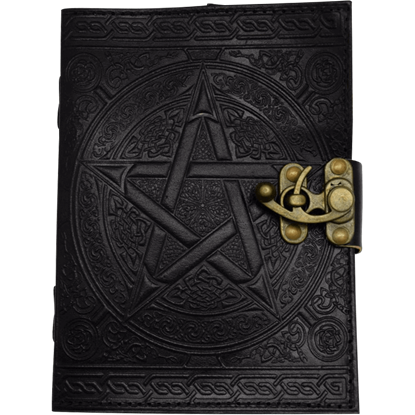 An iconic symbol of the various forces of nature and magic, the Black Pentagram Embossed Leather Journal displays an intricate five-pointed star design on its cover. Elegant knotwork patterns fill the space around the pentagram. 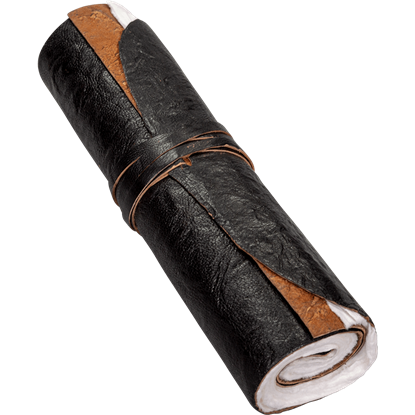 Easy to stash in a backpack or a large pouch, the Black Rolled Leather Journal adds authenticity to medieval looks and gives writing a historical vibe. 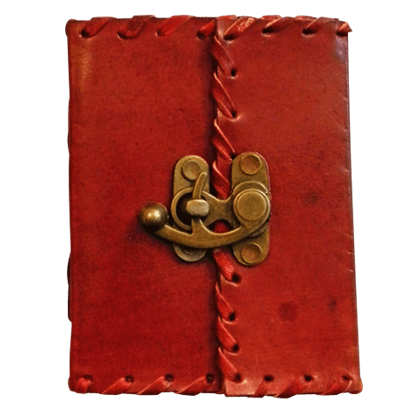 This medieval journal rolls up quite compact and secures with a leather cord. A journal often contains the innermost thoughts and dreams of its owner, making it an intimate collection of secrets not meant for the eyes of others. 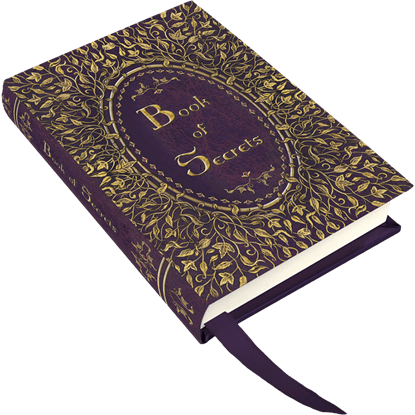 The Book of Secrets Mini Journal is a great option to record your words. Many strange and secret things occur in the dark watches of the night, invisible in the black patches of shadow. 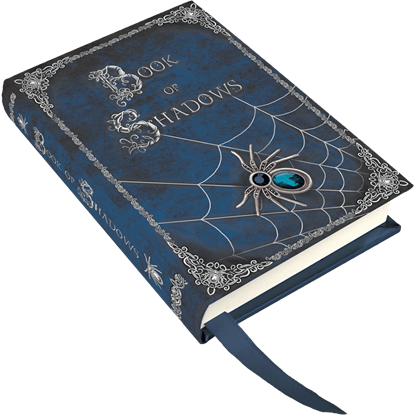 The Book of Shadows Mini Journal draws upon this sense of mystery in the design of its front cover and spine.